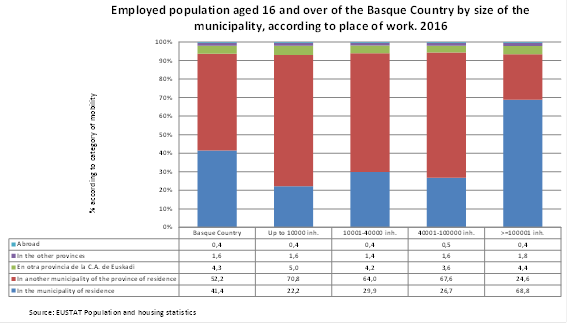 In the Basque Country 531,182 people aged 16 or over worked in a municipality other than the one they resided in, according to Eustat data. Specifically, 473,263 employed people (52.2%) travelled to another municipality within the same province for work, 39,408 (4.3%) travelled to another province in the Basque Country, 14,736 (1.6%) travelled to another Autonomous Region and 3,775 (0.4%) travelled abroad. As for gender, women worked in the same municipality as the one they resided in to a greater extent than men, 42.5% for the former and 38.0% for the latter; in turn the percentages for men were higher than those for women in cases where the job was in another municipality in the same province (5.3 points more) or in another province (1.0 point more). At provincial level, Álava registered the lowest mobility for work reasons, as seven out of ten employed people worked in the same municipality as the one they resided in, due to the weight of Vitoria-Gasteiz. This ratio reduces to four out of ten people in Gipuzkoa and three out of ten in the case of Bizkaia. The regional data reveal that labour mobility was highest in Estribaciones del Gorbea (83.3% worked in another municipality), Plentzia/Mungia (82.9%), Valles Alaveses (81.7%), Arratia-Nervión (80.3%) and Tolosa (79.2%). On the other hand, Llanada Alavesa (19.4%), Donostia-San Sebastián and Alto Deba (54.2%) and La Rioja Alavesa (55.3%) were the regions with the lowest labour mobility. At the municipal level, work-related travel was especially predominant in municipalities with a small population (fewer than1,000 inhabitants), such as Gaztelu, Sukarrieta, Fruiz and Arantzazu, where nine out of ten people worked in a municipality other than the one they resided in. At the opposite extreme, the lowest labour mobility was in the capitals, along with other medium-sized municipalities such as Irún, Oñati, Arrasate/Mondragón and Azpeitia, and in municipalities in Álava such as Laguardia, Villabuena de Álava and Elciego. The general rule that can be applied is that the larger the municipality the lower the proportion of external travel, so the percentage of those who work in the same municipality as the one they reside in went from 22% for municipalities with fewer than 10,000 inhabitants to 68.8% for the capitals, although municipalities with 40,001 to 100,000 inhabitants had a proportion (26.7%) slightly below those with 10,001 to 40,000 inhabitants. Furthermore, there were significant differences between capitals; thus, in Vitoria-Gasteiz labour mobility affected 15.1% of its working population, whilst in San Sebastián it affected 34.3%, and in Bilbao, 41.6%. In terms of travel between provinces within the Basque Country, employed people resident in Álava primarily travelled to Bizkaia (4.8%) and only 2% to Gipuzkoa; in turn from Bizkaia there was a similar distribution of travel between Álava (2.3%) and Gipuzkoa (2%); finally, 2.3% of employed people in Gipuzkoa had their job in a municipality of Bizkaia and 0.9% in a municipality of Álava. From a global perspective, Álava received 13,700 working people from the other provinces; Gipuzkoa received 12,220 and Bizkaia 10,229. Travelling abroad for work was an option chosen by 0.5% of people residing in the border province of Gipuzkoa, exceeding the Basque Country average, which may be attributed to its location. Those residing in Bizkaia equalled the average (0.4%) as did those in Álava, albeit to a lesser extent (0.3%).